Shark Attack! Remember how Spielbergs movie Jaws spoiled all summer beach vacations? That when you were in the water you would constantly scan the blue for suspiciously dark shadows or the horizon for this typical triangular fin? Haha, you calm yourself, your mind is playing tricks on you. 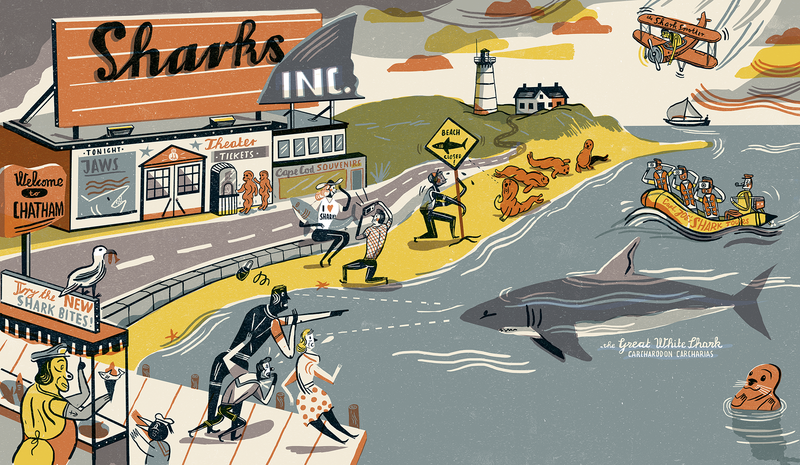 But idle phantasy aside, this scenario could happen taking a dip at Cape Cod encountering a real white shark! Thanks to strict environmental laws, a growing grey seal population attracts more and more of the sharks. But times for hysteria are in the past, today the shark population is welcomed by a number of environment conscious tourist rather taking a boat trip to see a great white for real than falling into fearful panicking!